The Cycle 24 Kits Beat Frequency Oscillator (BFO) will allow for reception of SSB and CW signals with an AM receiver. This is accomplished by injecting a carrier at the standard IF frequency of 455 kHz into the IF stages of the receiver. The frequency of the BFO is fixed at 455kHz but may be made adjustable with the addition of a variable capacitor. Because installation of the bfo will require internal connections in the receiver and these connections wil vary from radio to radio, it is recommended that this kit only be installed under the supervision of or with the assistance of a technically knowledgeable person. 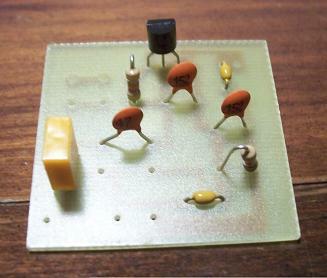 The 455 kHz BFO Kit is US$7.95+$2.00 shipping. Typically orders ship within 3 days however due to limited inventory delays of up to ten days are possible. If you would like to check availability before ordering please contact me via email: support at cycle24kits dot com. The BFO kit is currently being revised and will be available again soon, please contact me via email with any questions.